Ken Leibman founded South by Southeast (then a newsletter) and was perhaps the most democratic editor Frogpond has ever seen. He was also a noted poet with a strong regional bent, as evidenced in this handsome chapbook from 1990 (druidoaks). Kenneth Leibman's collection includes 51 haiku, one haibun, and a short bio by the author. There is also a description of the linguistic origin of 'alachua'. 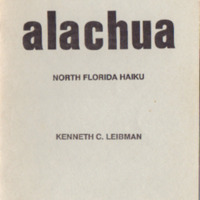 Leibman, Kenneth C., “Alachua - North Florida Haiku,” The Haiku Foundation Digital Library, accessed April 22, 2019, https://www.thehaikufoundation.org/omeka/items/show/165.